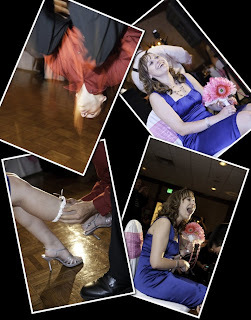 One of the best parts when shooting an event such as a wedding is to expect the unexpected. People do the funniest things at weddings. In this sequence of images, the DJ begins to give the instructions to the guy who caught the garder. Just as the DJ started to talk the guy did a standing back flip on the dance floor. Out of the corner of my eye I saw him start to do the back flip and I turned and fired off a few shots. The camera was at waist height and the lens zoomed out to 17 mm. This all happened in a blink of the eye. Notice the motion blur and how close he was to the floor. He performed a perfect (in my eyes) back flip. Immediately, I turned to the young lady who caught the boquet earlier to capture her reaction. The next image is when he started and the last image is when he was finishing. A few images in between are not shown. One of the best parts when shooting an event such as a wedding is to expect the unexpected. People do the funniest things at weddings. Years ago I learned to expect the unexpected. Regardless, if the event is a wedding, party, corporate event, or sporting event, always expect the unexpected. In this sequence of images, the DJ begins to give the instructions to the guy who caught the garder. Just as the DJ started to talk the guy did a standing back flip on the dance floor. Out of the corner of my eye, I saw him start to do the back flip and I turned and fired off a few shots. The camera was at waist height and the lens zoomed out to 17 mm. This all happened in a blink of the eye. Notice the motion blur and how close he was to the floor. He performed a perfect (in my eyes) back flip. Immediately, I turned to the young lady who caught the bouquet earlier to capture her reaction. The next image is when he started and the last image is when he was finishing. A few images in between are not shown. One of the most amazing items I find about a wedding is that even thought the outline is very similar. Non of the weddings are the same. There is always so much emotion that takes place and so many types of photography available. From the candids when the bride is getting ready before the wedding to the emotions flowing when the bride and groom see each other for the first time. Then a quick pan to the bride and groom's family as we capture the smiles and tears. Wow! The emotion that takes place is unreal. Then we slow down some for the formal portraits but the emotion kicks in again when we take all of the fun portraits. The entrance into the reception hall brings more fun activities and emotion. Oh, so much fun. Until next time, get out and enjoy the beauty of life!